Today I woke up to chilly temperatures and a definite Fall-like feel to the morning. While the days still feel like summer, the mornings and evenings are beginning to take a turn toward Autumn. In the US, nothing says Fall more clearly than the start of football season. This past weekend was the opening of regular season football. Last week I created a few recipes for your tailgating party, today I bring you something to get you ready for the end of the season! It's time to think big for your team and plan your playoff celebration cake! Being a Buffalo girl I find it a little difficult to even think about calling this a playoff celebration cake, but you can always dream! 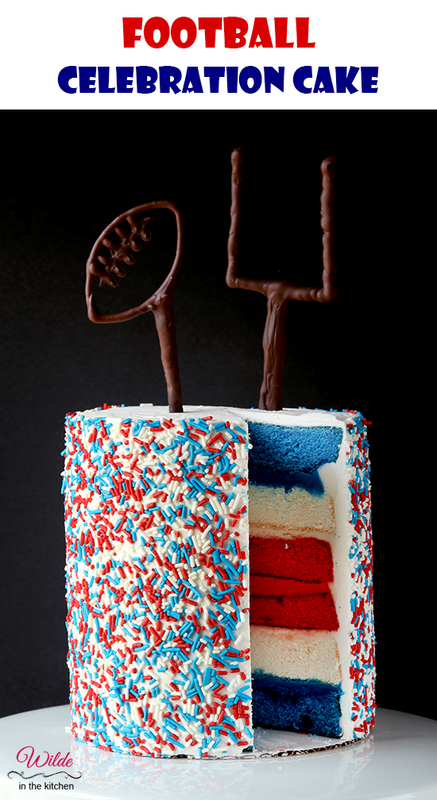 I made this cake to celebrate the Buffalo Bills. 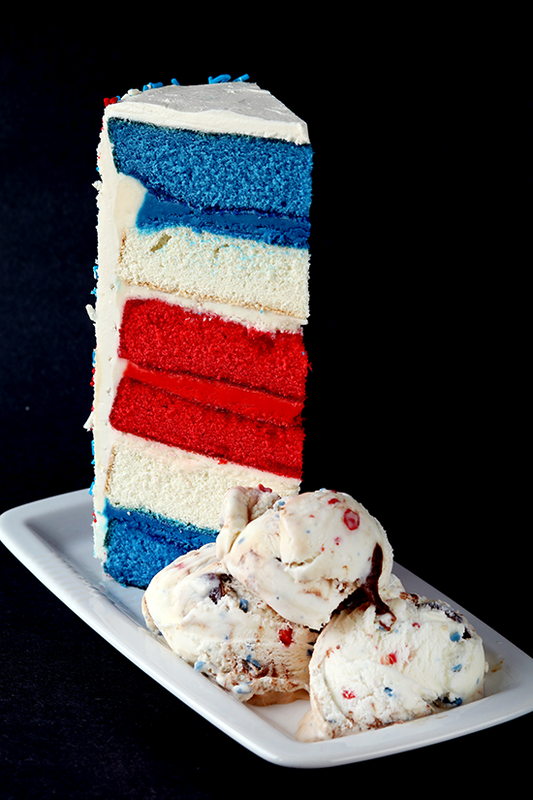 The layering of colors in this cake is reminiscent of the team logo, with a red stripe slashing across a blue buffalo. If you call yourself a fan of another football team, just swap out the colors for your own team colors! I made a custom blend of red, white and blue sprinkles from three bottles of single colors that I bought at a local cake supply shop. You can pick up your team colors at Michaels Arts & Crafts or online at Amazon. The cake toppers are also super easy to make! I found a clipart image of a football and traced it onto wax paper. Melting some chocolate chips and transferring them to a zip-top bag with a small piping tip, I was able to draw out the chocolate football and endzone upright. 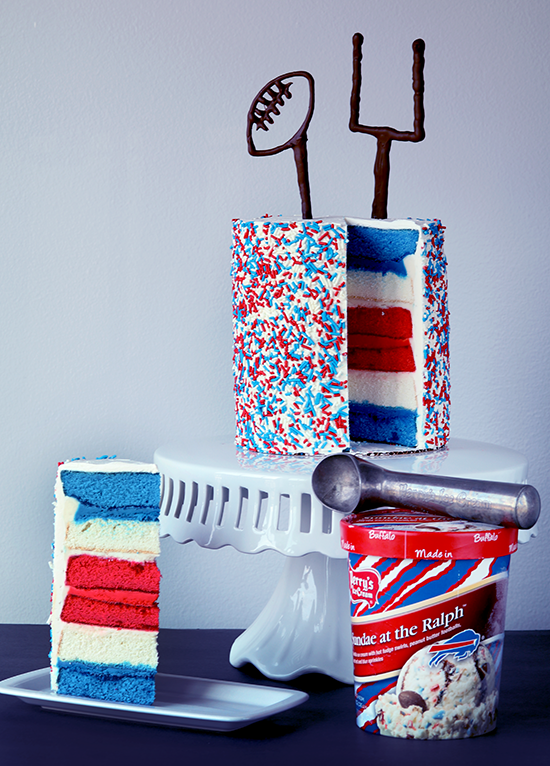 To keep the local spirit going, you should pair your celebration cake with a local brand of ice cream! 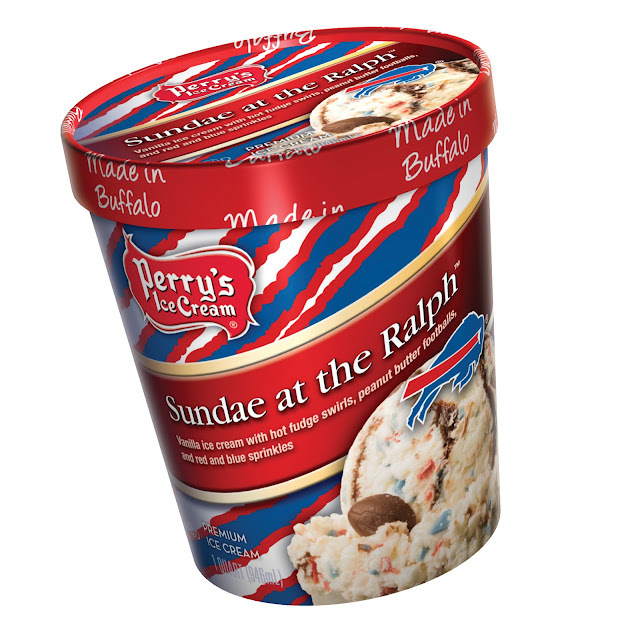 Perry's is the local brand of choice in Western New York and I have paired my celebration cake with the "Sundae at the Ralph" flavor. 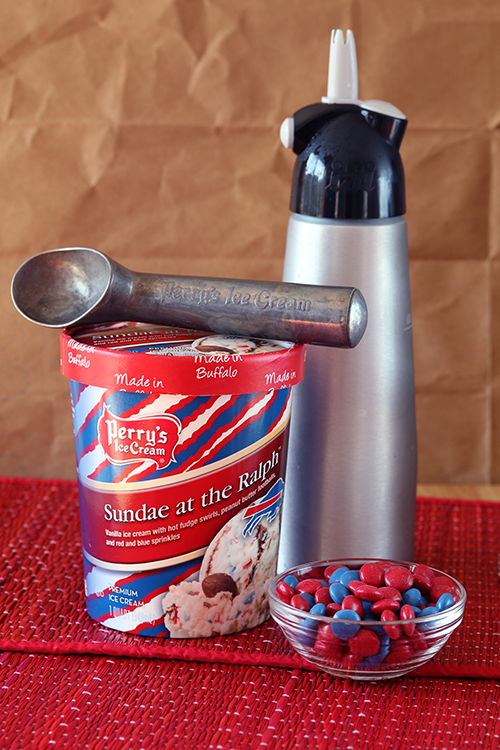 The red and blue sprinkles in the ice cream go right along with my team color theme! 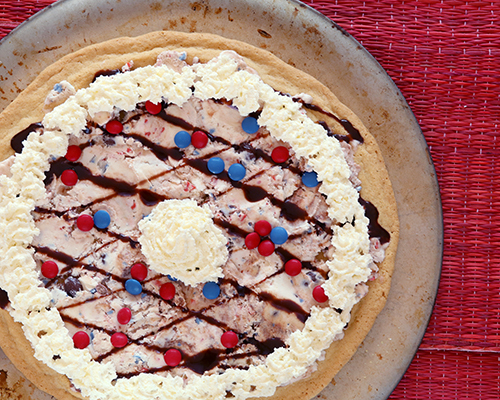 Go ahead and plan for the best, buy your sprinkles and food coloring and get ready to celebrate! 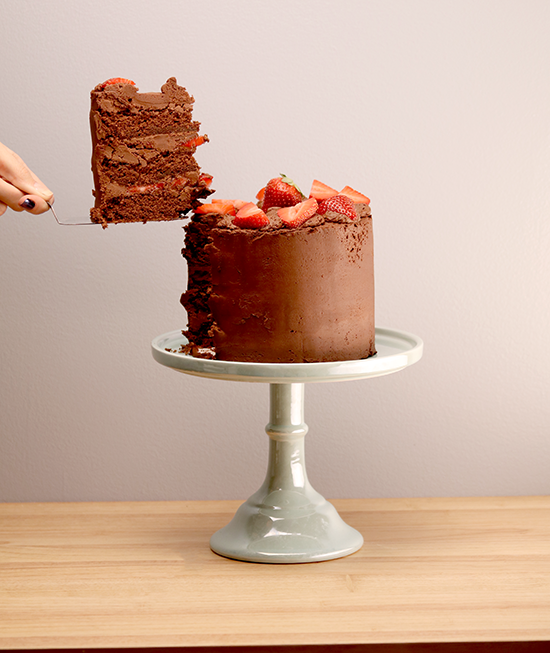 Or just enjoy practicing your layer cake skills and eating the delicious results. With just a week left until Christmas, it's time to choose your dessert recipes and head to the grocery store. 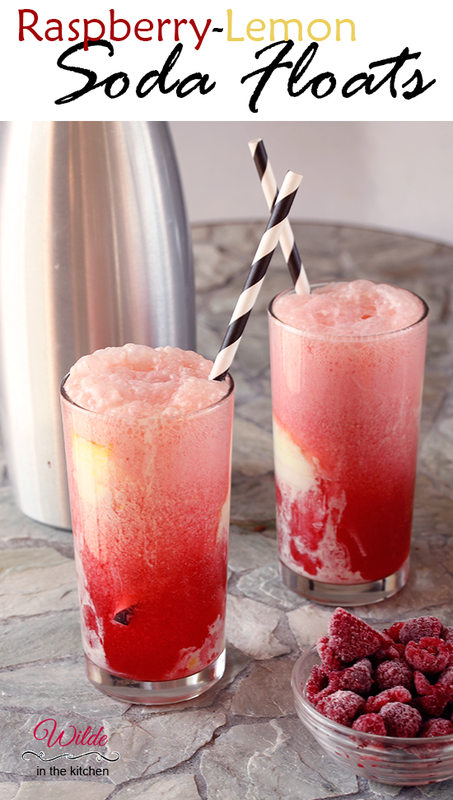 I'm going to recommend making something that looks fancy but isn't that difficult to make at all! A roulade! 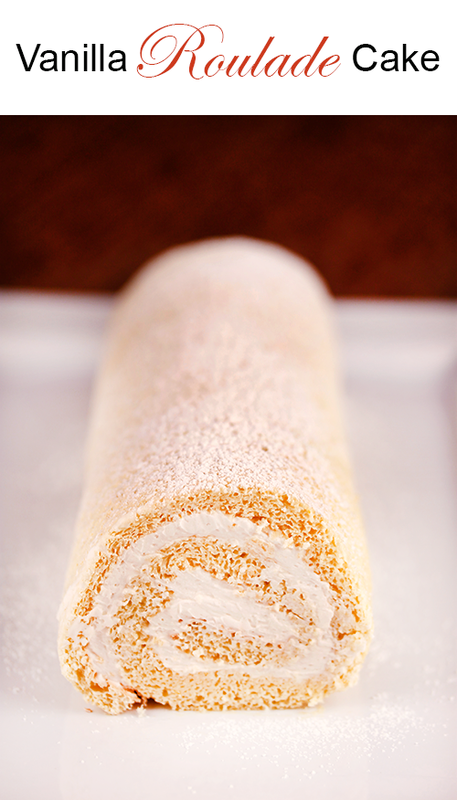 A roulade is simply a thin sponge cake, rolled up with a buttercream filling. You can add any flavoring to the buttercream to change it up for the seasons. 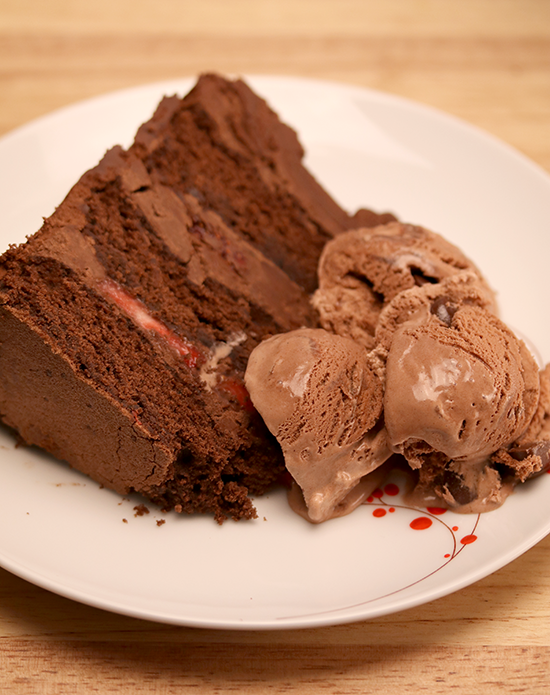 Instead of making a peppermint or chocolate roulade, I decided to pair my cake with an incredibly flavorful ice cream! 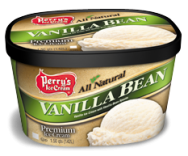 I'm happy to be working with one of my favorite hometown brands - Perry's Ice Cream - and bring you their amazing new Winter flavor! A few weeks ago, I received a package containing their traditional Fall flavor, Pumpkin Pie, and this new one, Gingerbread cookie. I was a little leery at first, I'm not a huge gingerbread fan, but one bite had me converted. Even the boyfriend took me up on the offer to try some and he wound up making a good dent in the container. 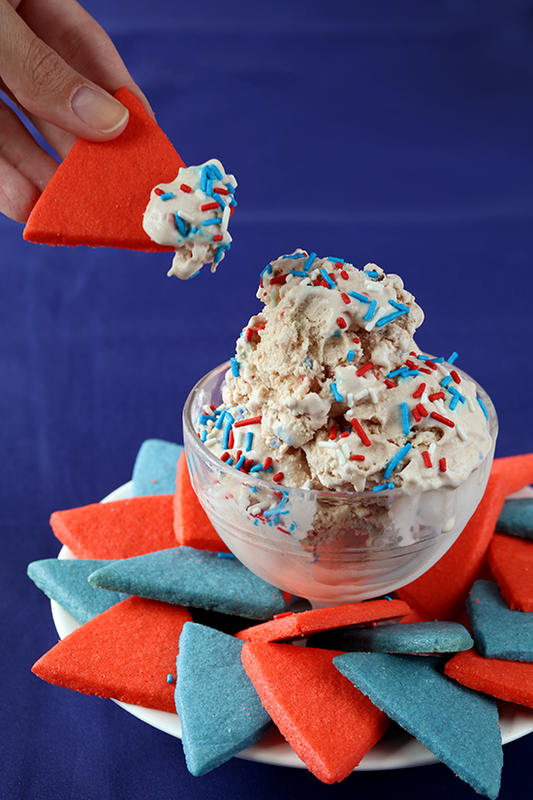 This ice cream is surprisingly complex. 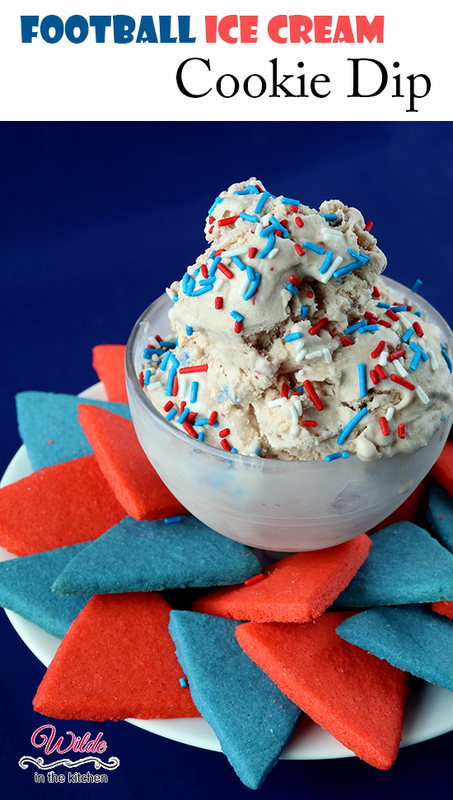 The gingerbread ice cream base is dotted with cookies and filled with ribbons of vanilla icing. I only wish that they sent me just one container, because I will inevitably eat both containers myself. To make the roulade cake, I enlisted the boyfriend to help me. He generally avoids baking with me, it's not his thing, but this was my lucky day! 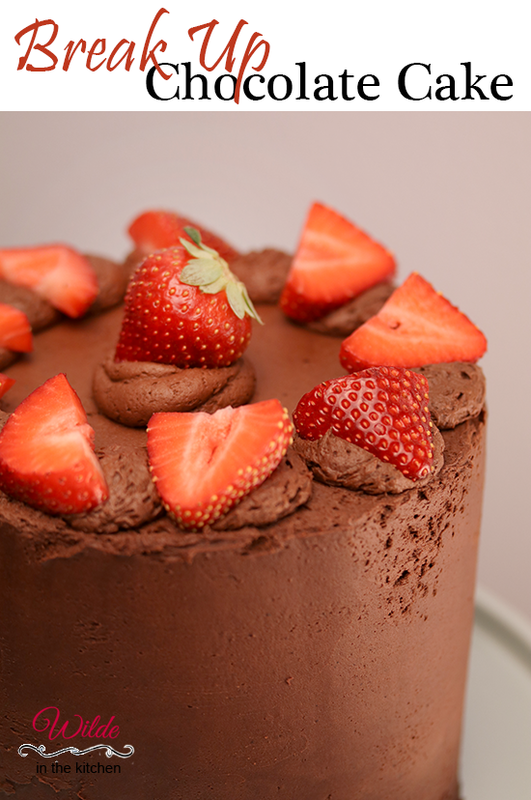 After prepping all of the ingredients, the cake came together very fast. 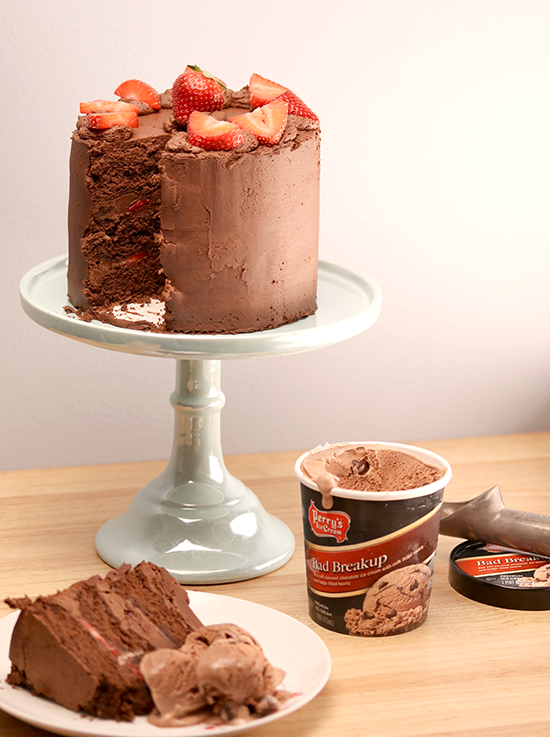 After cooling, filling and rolling, this cake really topped off our evening. It would make for an impressive and delicious addition to your holiday table! Disclaimer: I received a box full of Perry's Ice Creams Fall/Winter flavors to try out. I have not received any other compensation for this post and all opinions are my own. I am so happy to partner with small, local companies and share them with the world. I grew up with Perry's and it continues to remind me of home. One Year Ago: Wilde Cookies - A list of all the cookies I've made here at WITK! Thanksgiving week is upon us! I thought that instead of bombarding you with dozens of pumpkin/stuffing/turkey recipes this year, I would give you a single, delicious one. Inspired by my favorite hometown ice cream brand - Perry's Ice Cream! I'm sure you've all been seeing images of the snowstorm that hit Buffalo, New York last week. Houses buried under five feet of snow, snow drifts up and over cars, highways closed, grocery stores cleared out, people building beer fridges out of the snow, etc, etc, etc. I'm proud to hail from that part of the world and I'm all too familiar with that type of weather. Don't worry about Buffalo. They generally dig out in a day and carry on with their business. 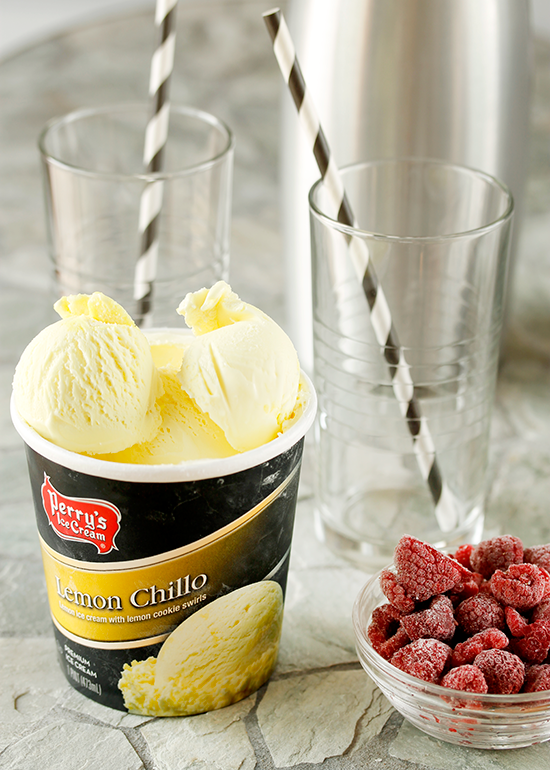 Even with all that snow, Perry's Ice Cream continued churning and making tasty flavors for their local fans. 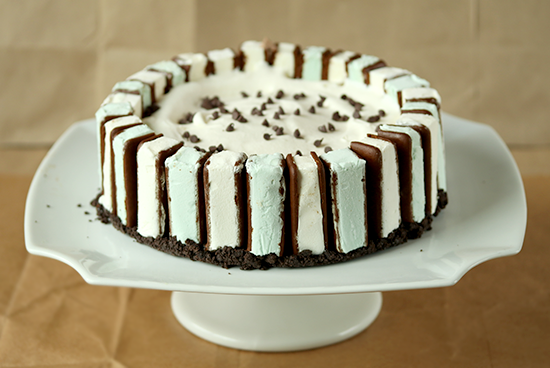 (I'm loving the looks of this chocolate cookies and cream they just created!) 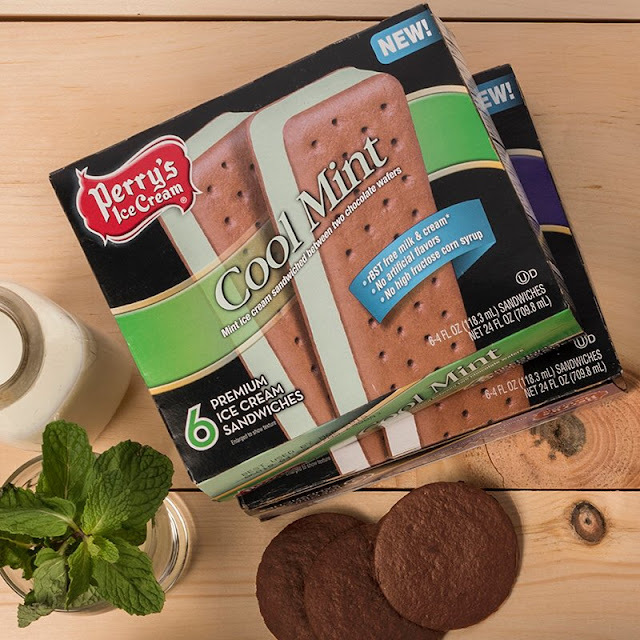 Each fall, Perry's comes out with a few limited edition flavors. This year I was lucky enough to receive two containers of their new Maple Cheesecake ice cream! I promptly ate one of the containers. If you are in the WNY region, be sure to pick up a container of this stuff. 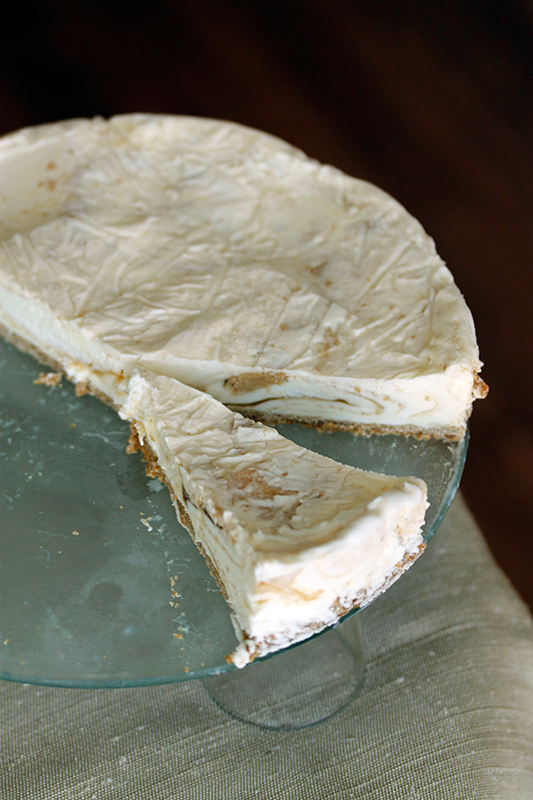 The cheesecake flavor is really mild and disappears behind the maple. 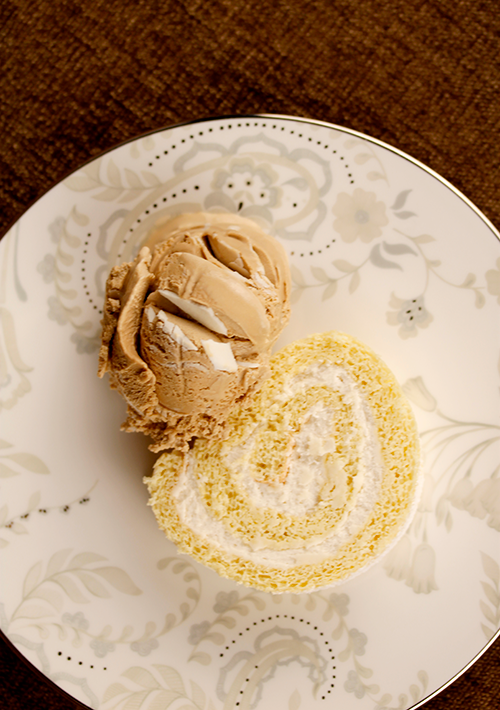 It's not just maple, there's ribbons of maple crunch running through the ice cream. The second container was set aside for my "Friendsgiving" this past weekend. 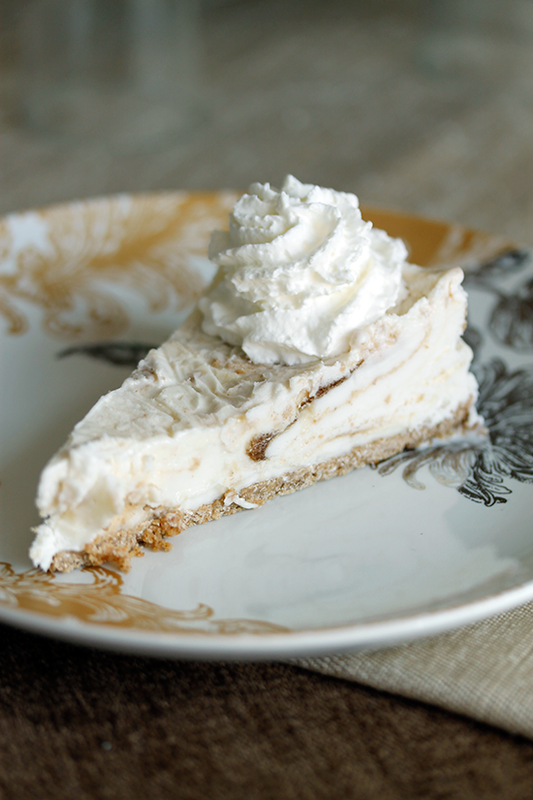 I decided that in addition to the traditional pumpkin pie, I would make an ice cream pie. It's an incredibly easy pie to make. Just put together your favorite cookie crust, I made the Momofuku Milk oatmeal cookie crust, and top it with the ice cream! 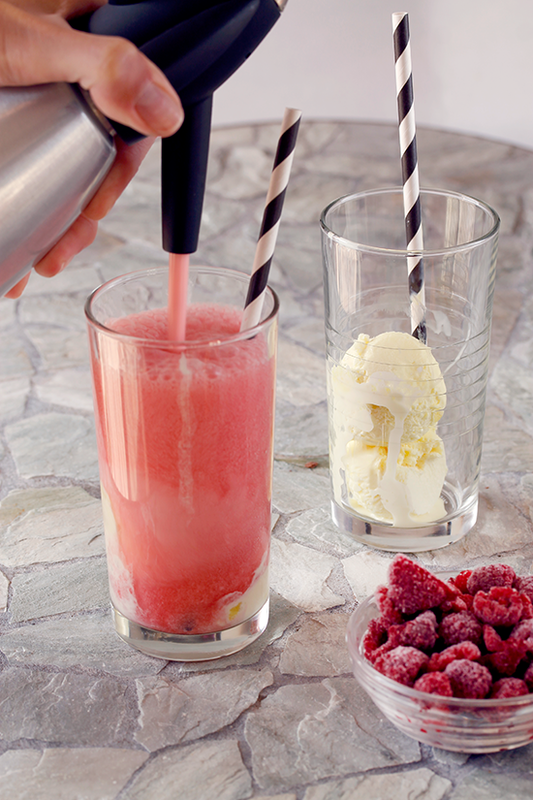 Freeze until solid and serve with some whipped cream. 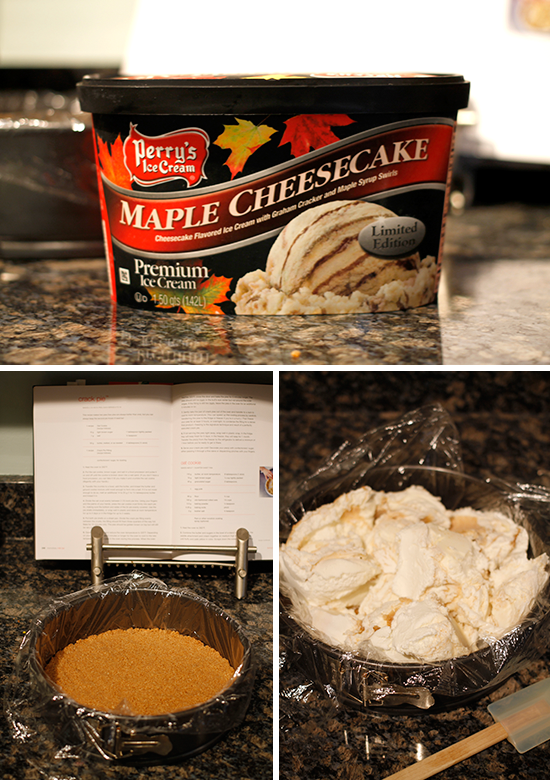 When given the two options of pumpkin pie and Maple cheesecake ice cream pie, what do you think my friends chose? I'll let the entire pumpkin pie in my fridge answer that question. Not in a Perry's region? 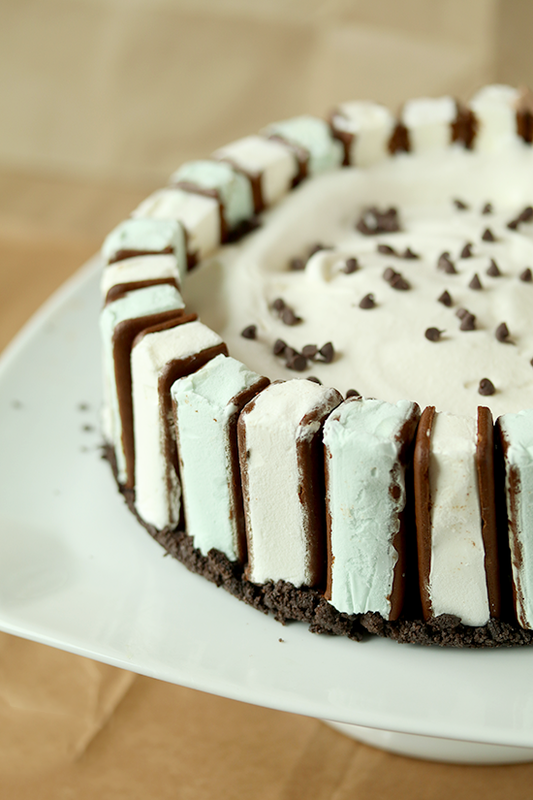 This ice cream pie would also be amazing with butter pecan or toffee-flavored ice creams. 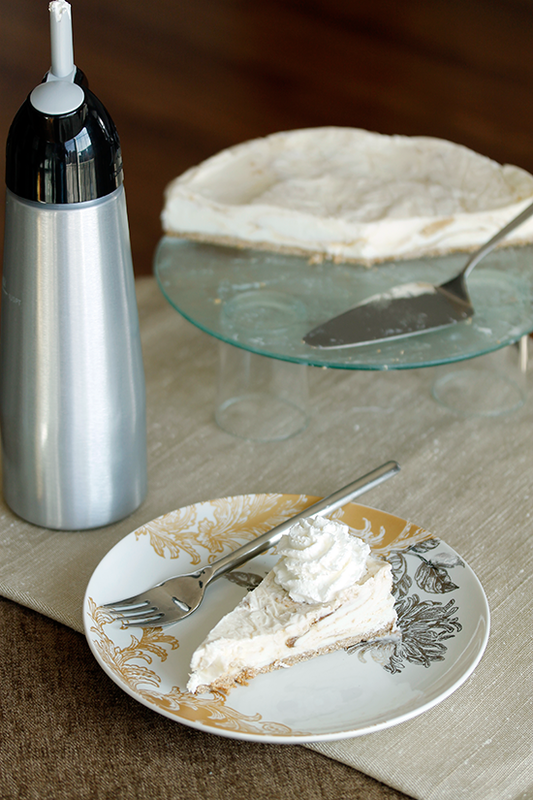 Just keep it simple and you'll have a tasty Thanksgiving dessert in no time! 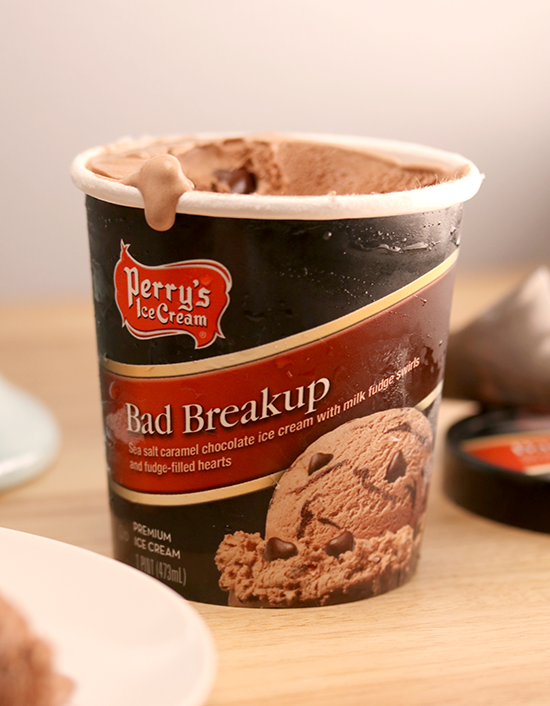 Disclaimer: This post is not sponsored by Perry's Ice Cream. I am a member of their Inside Scoopers program and via this relationship they occasionally send me their new flavors. I receive no financial compensation for these posts and all opinions are my own. 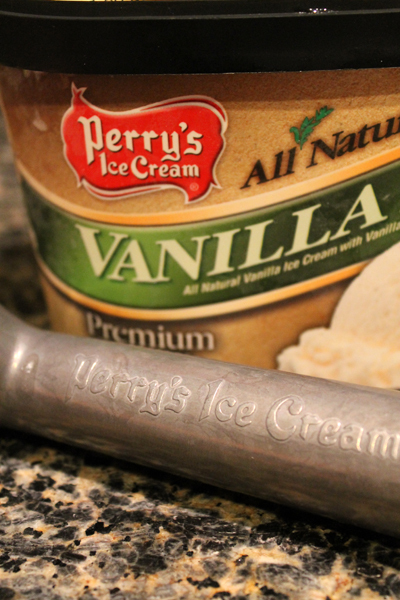 That being said, I've been eating Perry's Ice Cream since I was a little girl. It is awesome. It's summertime! I'm just a few hours away from boarding a plane and flying home for a visit! I tend to go home to see my parents twice a year, Christmas and summer. That way I get to see both of the Buffalo seasons, winter and July. Well, that's how the old joke goes. I'm more in the camp that Buffalo has four distinct, yet unequal seasons. Fall starts rolling in immediately after Labor day. In mid-September, the leaves start to turn and the sweaters and jeans quickly reappear. I think it's Fall that WNYers live for. I always loved Fall because it meant going back to school. But then again, I'm a nerd and totally loved school. Feel free to make fun of me. Yes, winter is long and snowy, but you'll rarely hear a local complain about it. "What is winter without snow? ", they will tell you. I remember several Christmas eves, driving through blinding snow to get to my grams house. Spring is rainy and cool and it tends to last from early May until mid June. It gives you plenty of time to plant your gardens and clean up from the winter mess. Summer pops it's head in around early July and brings sticky, hot weather. We didn't have air conditioning in my childhood home. I was only ever upset about it for one or two weeks a year. You don't get 100 degree days in Buffalo, but humidity will make you wish you had a cold drink in your hand all day. You might remember that I'm lucky enough to be a Perry's Inside Taster! This means that once or twice a year, then send me ice cream! This is super important these days, because my Wegmans in New Jersey have stopped carrying the brand! (Worse day ever) This summer, I received a large box of dry ice and three containers of Perry's. Three containers of ice cream that were all destined for something different. First, the French Roast Coffee. I never saw this ice cream. The package arrived and I put the containers in the fridge. I left for a conference. When I came home, the ice cream was no longer in the fridge. The boyfriend may or may not have eaten the entire container of ice cream himself. He wouldn't fess up. Next, Otto's Cupcake. I saw this ice cream a few months back, during Sweet 16 basketball time. It's chocolate ice cream, with pieces of chocolate cake and orange frosting swirled in. Let me be clear though, the frosting swirl is orange in color, not orange in flavor. My dad and I both had some and discussed this point for a good five minutes. We were both expecting orange flavor because we didn't read the box before we ate it. This ice cream was tasty. Finally, All Natural Dark Chocolate. 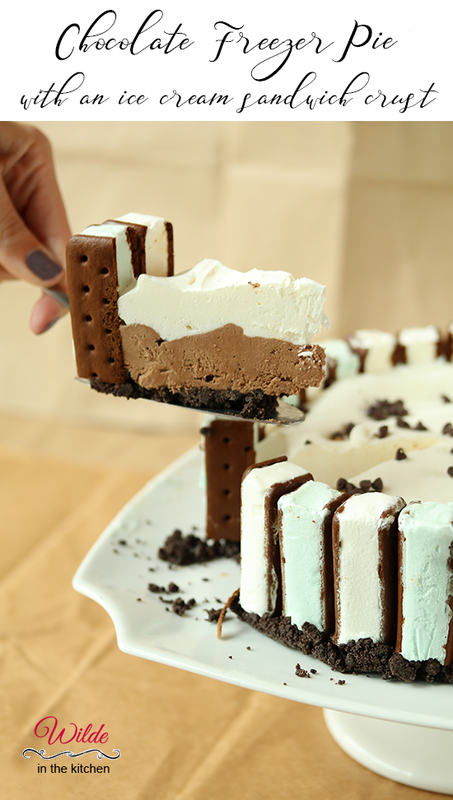 This ice cream made its way into those ice cream sandwiches you see above. 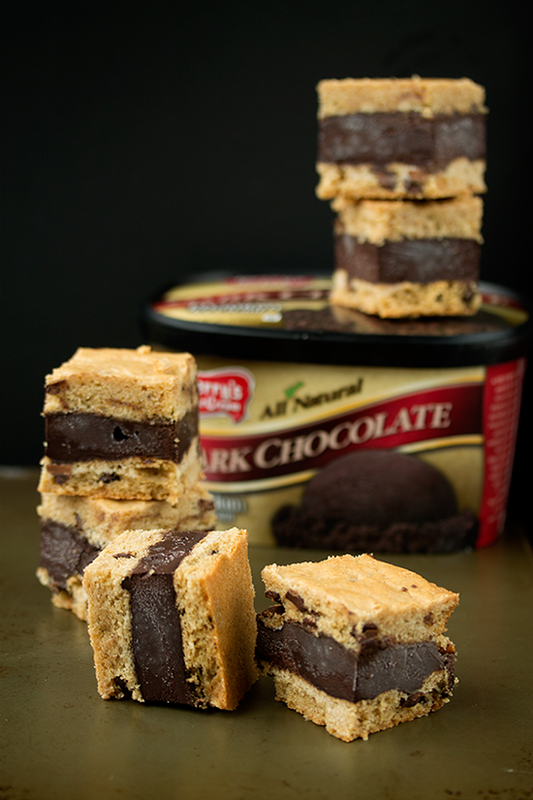 I was inspired by these brownie ice cream sandwiches from Smitten Kitchen. I knew that I still had a container of chocolate Perry's in the freezer and thought nothing would pair better with the ice cream, than peanut butter. I whipped up a batch of my favorite peanut butter bars, divided the batter in two and sandwiched almost the entire container of ice cream between the two slabs of peanut butter bar. The boyfriend thinks my ice cream to cookie ratio is off. He's just crazy, these ice cream sandwiches are amazing. Give them a try! Or come over, I have a whole pan of them to share! My morning train has been emptier and emptier. Friday morning promises to give me a three-seater all to myself! There have been fewer and fewer people in the halls at work. My company is closed next week for our winter shutdown and some people choose to extend this vacation by taking a few days this week as well. I'm pretty sure there will be 10% of the people in the building and maybe 1% of them will be doing actual work. T minus five days - Boyfriend has fled the cold weather to visit his parents in Florida. This is a good thing. While we will be spending Christmas apart (I'll be heading to Buffalo this to visit my own parents), I get to use this time to shop and wrap for the guy. I finished my holiday shopping last night after work. My antibiotics have helped me kick the bronchitis that took up residence in my chest. 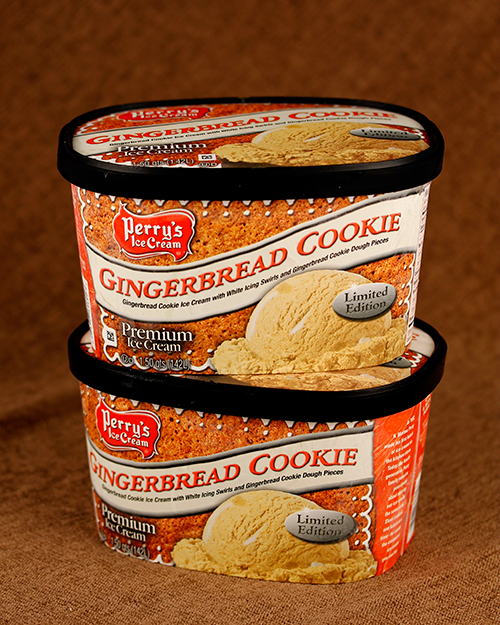 And Perry's Ice Cream sent me two containers of holiday flavors. It's time to celebrate! Actually, the container of ice cream pictured is not the original one that they sent me. I accidentally ate all of that one. All by myself. Don't worry, it took me almost two weeks to eat the whole container. BF and I had to make our way to the New Jersey Wegmans and buy the last container of peppermint ice cream. 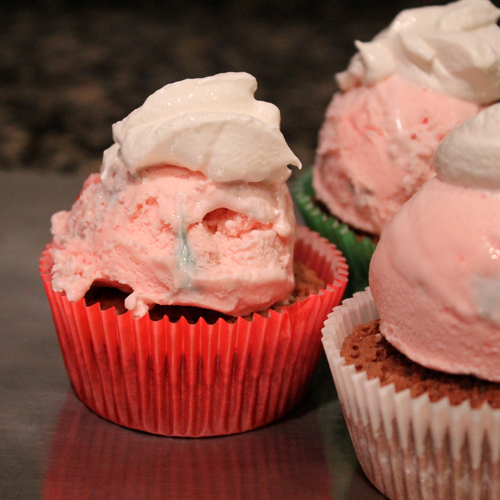 Before I ate all of the ice cream, I had plans to make these little brownie cupcakes. These dessert treats are really simple and perfect for a complicated holiday dinner. 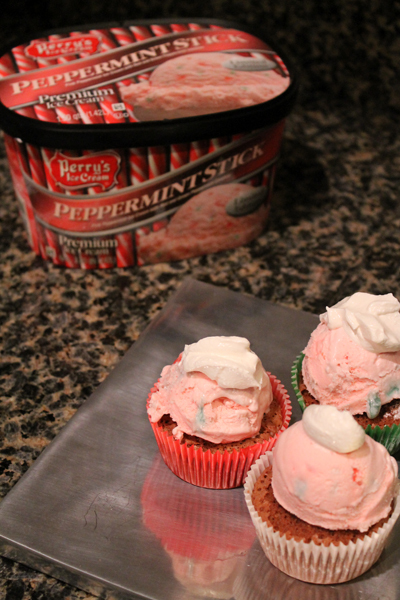 Make some brownie cupcakes, top them with your favorite mint/peppermint ice cream and add a dallop of whipped topping. Hello delicious. Happy Holidays everyone! I hope that you get to spend some time with the ones you love. Many thanks to Perry's Ice cream for helping it feel like home, all these miles away from Buffalo. I've also found that if people know about Perry's Ice cream, they love it. If you can find it, give it a try! Is there anything that reminds us of home more than food? Whether it be your moms special dinner, your dads secret sauce, the local diners Wednesday night special or the family owned soda shops hand-churned ice cream, there is something about having a meal in your hometown. Western New Yorkers have a list of things that are near and dear to their hearts. We have Teds Hot Dogs (and now the renegade spin-off, Theodores) with their traditional coal-fired grills. Those in search of a greasy and delicious sub sandwich know to head to Viola's in Niagara Falls. Looking for good wings? Head to the Anchor bar when in the city, or Duffs when in the suburbs. Want amazing chocolate? I always head to Watsons. 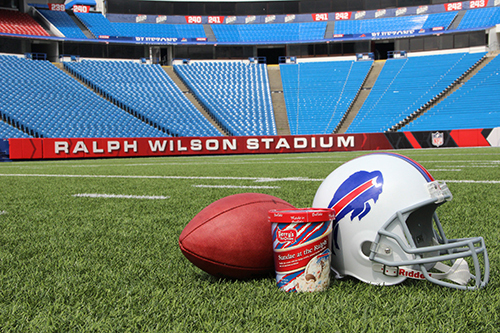 There are also a whole bunch of local goods that ex-pat Buffalonians stock up on when visiting home. We leave room in our suitcases for Chiavettas bbq sauce, Webers mustard and your favorite wing sauce. I consider packing fewer clothes than I actually might need so that I can bring home the biggest box of sponge candy that I can find. There has been one thing that I haven't been able to take home. Something that I grew up with and spent many an evening enjoying with my dad. Perry's ice cream. If you are a Western New Yorker or currently live near a Wegmans grocery store, you know about Perry's. It's the ice cream of choice for all local ice cream places. 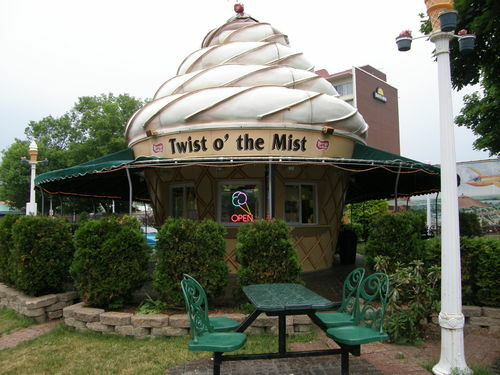 There is a huge ice cream cone right new Niagara Falls that will gladly serve you your favorite flavor of Perry's. It's called - The Twist of the Mist! In the first twenty-one years of my life, I must have eaten gallons of Perrys. I was so confused when I went grocery shopping for the first time in Wisconsin to find no Perrys. And sadly, ice cream doesn't travel well. I spent the next eight years enjoying my favorite ice cream only at home. My dad is a bigger fan of the brand than I am. I know there will always be at least four or five containers of ice cream in the freezer. This all changed a few months ago. I was feeling nostalgic for home during the hot summer months and tweeted Perrys. It was something along the line of "I miss you Perrys, come to New Jersey!" The response I got? "We are in New Jersey! Head to the Woodbridge Wegmans!" I nearly fell off my chair. Boyfriend picked me up a container of black raspberry next time work took him to central New Jersey. 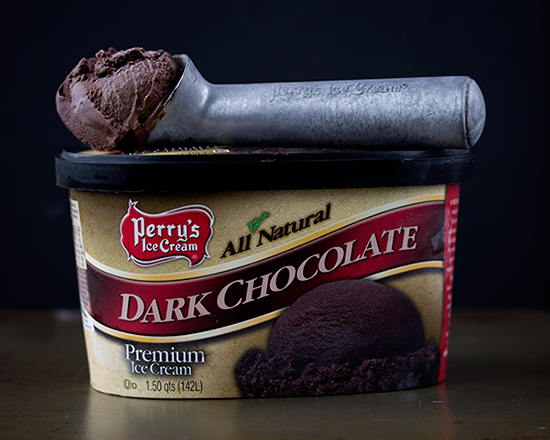 Life got even better this summer when I was contacted by Perrys and asked to join their "Inside Scoopers" team. 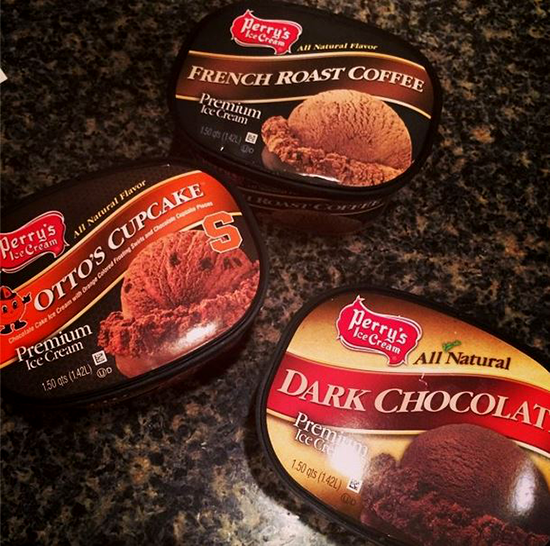 As an Inside Scooper, I get early access to new flavors and most exciting, a trip to the Perrys factory! My dad is super jealous. Why yes mom, my fingernails are green. ﻿For my first task as an Inside Scooper, I had to test out the new All Natural flavors. I know, tough job. These flavors are made the old fashioned way, the way ice cream was made before science got involved. No artifical flavors or colors. The way you probably make ice cream at home! 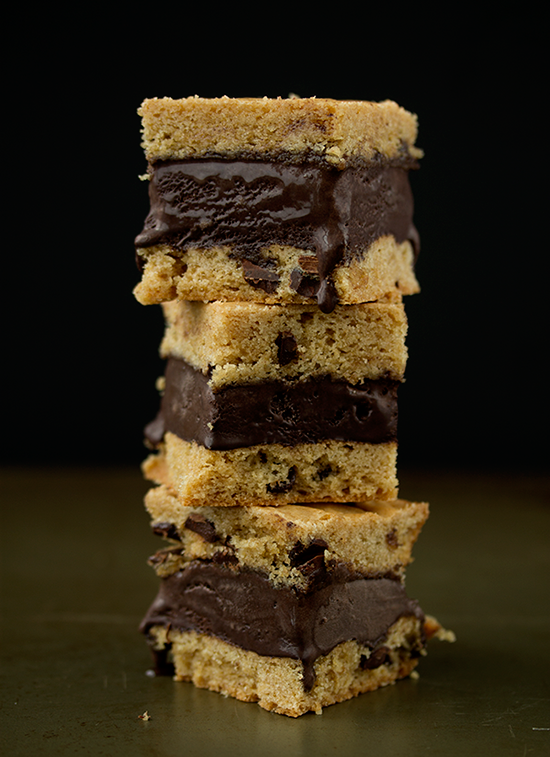 Four simple flavors - chocolate, chocolate chip, maple walnut and vanilla bean - that just beg to be eaten. Hello, my name is delicious. ﻿Now I know most of you don't have access to Perry's, but if you're in the WNY area, be sure to stop and get yourself a scoop. Until then, you can make (or buy!) 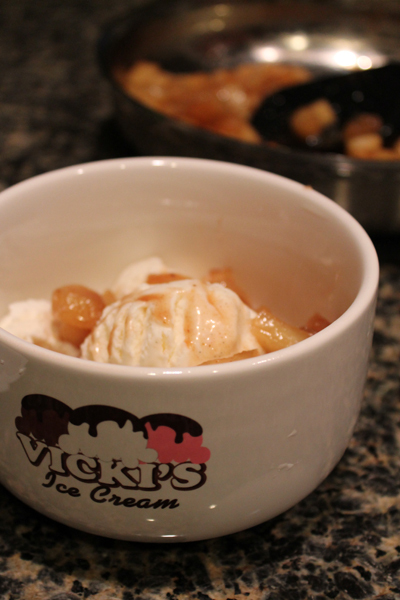 your favorite vanilla ice cream and top it with heaps of this... Apple pie topping. 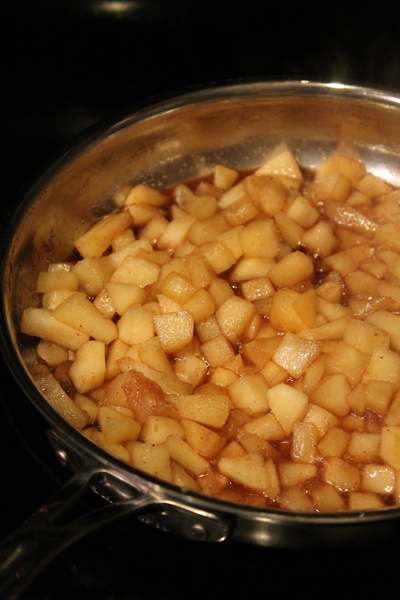 Chunks of sweet apples in a caramely sauce, spiced with cinnamon, nutmeg and clove. 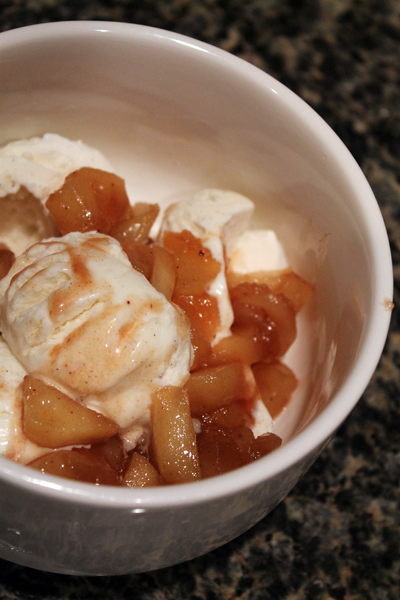 It's like an apple pie, without the crust. 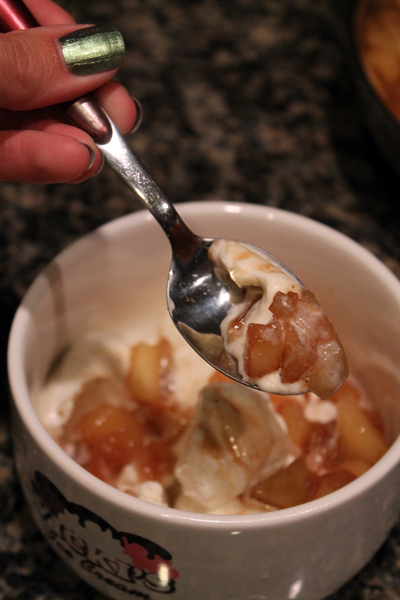 It tastes like fall and is just the thing to use up some of those freshly picked apples.